This week I was inspired by Tom Barrett's Blog and his own post on using Google Earth and Smart Notebook for understanding 3D shape. I decided to attempt this myself. 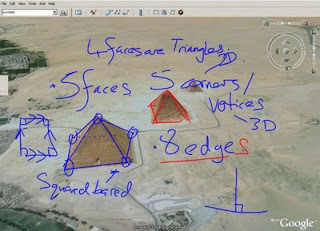 I started the lesson by using Google Earth to explore a 3D shape. The children using their whiteboards discussed the features and then I annotated the board. The kids where amazed as we zoomed into the location, which had been previously bookmarked. I challenged the children to find some more places we could investigate - so hopefully some more next week. Once this was done we moved on to investigating the different ways you can make the nets of the cube. I asked the children to mark the top and bottom face. I kept this activity open ended and challenged them to find as many different nets as possible. I borrowed from Tom again and used Smart Notebook to allow quick recording of the nets using infinite cloner. It was a successful session and the children where working seamlessly with the computers to support the learning. I stayed with Google this week after being inspired and decided to use Google Docs and the form creator to aid with our formal writing. We had previously written forms about how to join a Library or a swimming club. I created a simple login for the whole class to use and they had simple instructions to follow to start a from. The children's task was to use the form creator to help them create a form for applying to be a secret agent or a sports player. Unfortunately the idea while sound didn't mesh with the ability of my class. I have the lower ability group and while they understood the idea of what they had to do, they spent a long time on the ICT and not the literacy. I've had this discussion before how are children supposed to use the ICT tools the new frameworks calls for without learning the skills. I don't want an Literacy lesson becoming a ICT teaching lesson. Some of the higher ability worked well and did achieve a lot. Something to try again but with a different ability range. This is one of the form that where created. Hi Nic - only just found this but wanted to say thanks for trying my lesson out. It is one thing seeing ideas implemented but much stranger seeing the same lesson - I hope you found it successful. You should have said and you could have had the SMART Notebook file I made. Thanks for all your support in terms of what I do and I hope I will get another chance to meet you and Anthony soon.